Do not use Lampreys for bait in streams or lakes that they do not already inhabit. It is illegal to use non-native baits in many waterways, and no one wants to see this invasive species spread. Young Lampreys are often one of the best baits for all manner of fresh water fish, especially walleyes. World record sized walleyes have been caught using Lampreys presented on Northland Float ‘N Spin lures. The Float ‘N Spin is a basic in-line type trolling spinnerbait, only with a floating styrofoam body and one- or two-hook trailer for presenting baits. To test the lure’s effectiveness with lampreys, I slow trolled a traditional setup, which consisted of a slip sinker, barrel swivel and 18 inch leader to a No.4 hook. On a second pole, I attached a Float ‘N Spin in place of the plain hook. The spinner caught walleye, about 3 or 4 fish for every 1 the regular hook caught. The fish hit harder, too, especially where the water had a blue green tint. Wherever the water’s low, I don’t add the slip sinker, relying only on the weight of the No.3 brass barrel swivel to sink the rig. It rarely gets stuck, and I only troll down-stream, the natural direction of the eels’ migration, I prefer to use oars for this, especially when by myself. A couple of quick thrusts with the oars seems to trigger strikes from fish that are just stalking the bait. But, the move the walleyes really like is a hard turn; as soon as the lure changes direction they really hammer it. Almost all of the best fishing is done at first light. Both of the aforementioned record walleyes were caught around 5:30a.m. The fishing poles sit between my feet, in easy reach for quick hook sets. The lures’ razor-sharp hook easily penetrate the bony mouths of big fish and also the very muscular bodies of the lively lamprey baits. 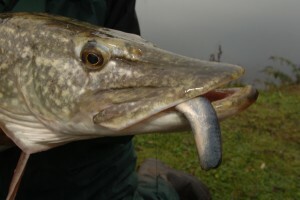 Hook a lamprey through the first port-hole for walleyes. For smallmouth bass, hook it through the middle of the body. Lampreys are native worldwide to rivers that flow into the oceans. But they are best known in the U.S and Canada as invasive species, for their decimation of the native lake trout in the Great Lakes, which occurred during the 1950s after lampreys were accidentally introduced to the lakes. Commercial fishermen in Lake Michigan took 6,860,000 pounds of lake trout in 1943; by 1952, the catch was down to 3,000 pounds. Today, millions of dollars are spent on lamprey control in the Great Lakes. While they may never be eradicated, they are being kept in check. Lampreys usually spawn in the spring, building pyramid-shaped nests of small rocks in strong currents. The female lays 50,000 eggs that get lodged in the gaps between the stones. The male fertilizes the eggs, and soon after, like salmon, both parents die. About a month later, the very small eels, or larvae, emerge. They head for sandy or muddy backwaters where there is less water clarity and they feed on decaying organic matter for the next four years. Eventually, they reach a length of about 6 inches, develop a sucker mouth and large eyes, turn from a brown green color to a silvery blue, and then, in the fall of the year, begin to migrate down river to the ocean. Late season rains carry heaviest downstream migrations of lampreys, and this is when walleyes and other fish feed heavily on the little eels. 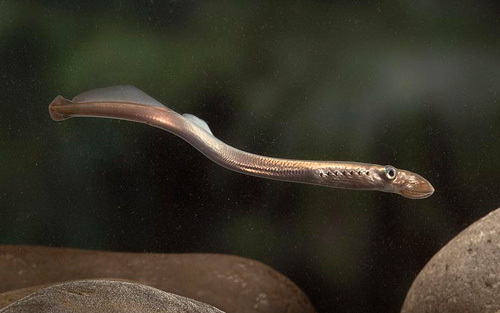 Adult lampreys become parasitic while maturing in the big water. They attach to host fish and drain the blood and bodily fluids for up to a year, often attaining a length of 2 feet. When they drop off a host fish, they head up river to spawn, they no longer are parasitic. Lamprey baits are illegal to buy or sell in most regions, but they are still legal bait. This just means that you’ll have to harvest your own. They can usually be found in a foot or two of water along muddy banks or backwashes filled with decaying leaves. A common coal shovel works well for collecting lampreys from the shallows. Angle the shovel down, about 4-inches deep, and slide it along bottom until it fills with mud and debris. Throw this muck onto the bank and use a hand to briskly sift through it, making “S” patterns as you go. When the mud is stirred, the lampreys start moving and are easily seen and picked up. Put them in a pail of river water with some mud on the bottom. They can be kept this way for months with proper aeration, and when the bite is on, you’ll be ready!